Oak Tree Meadow01621 856503work ParkOak Tree Meadow is located in Heybridge, on the opposite side of the canal to the Tesco superstore. The site is accessible on foot from Heybridge via the footpath/cycleway alongside the canal or from Maldon via the footpath along the river wall from Fullbridge. Oak Tree Meadow is located in Heybridge, on the opposite side of the canal to the Tesco superstore. The site is accessible on foot from Heybridge via the footpath/cycleway alongside the canal or from Maldon via the footpath along the river wall from Fullbridge. 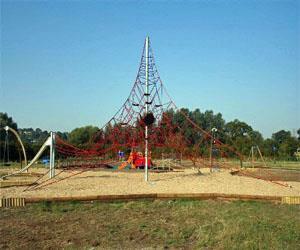 The site boasts one of the largest and best equipped children's play sites in the Maldon District. The play equipment has been designed so that it is exciting and challenging for children of all ages.